In December it was Christine’s turn to receive three blocks in her chosen colours dark grey, turquoise and coral. She also likes scrappy, so where for other people’s blocks I would have repeated certain fabrics a bit more, for these blocks I tried to use as many different fabrics as possible, even though I don’t have a huge collection. For my first block I started with a square and inserted narrow strips. It was then cut wonky and framed in two other fabrics. Quite simple, but effective I think. For my second block I pieced strips of different widths and then cut the resulting piece into columns of increasing width that were framed and connected using narrow strips. For my third block I started with a square that was then framed in a wonky border. Somehow this reminds me of a tv, I know I’m a bit weird. I think this may be my favourite block this month. As usual the blocks that were made by the other participants of the swap can be viewed in the F2F gallery. I’ve made a piece of underwear! They’re Thread Theory’s Comox Trunks and I made them for my brother. Clearly, the best part of these trunks is the elastic! I don’t have a lot of elastic in my stash and what I had didn’t feel nice enough to sit next to your skin all day long. I wasn’t very optimistic about finding anything really nice and then stumbled upon this elastic in a stall at a local weekly market. It feels very soft and it has stars on it! They also carried several different colours. Just brilliant. These trunks were easy to make but I didn’t follow all of the construction steps. The attachment of the binding pieces to the fly seemed a bit fiddly so I simply folded the binding strips in half and used my overlocker to attach them to the front pieces. This does leave an exposed seam inside the fly but since I suspect most men don’t even use the fly I don’t think this will be a problem. I sewed the inside front pieces wrong sides together. As a result the seam allowance ended up inside the fly and not on the inside of the trunks, so there is one exposed seam less that might cause irritation. With hindsight I should also have done this with the binding piece for this front piece because that seam did end up on the inside of the trunks and could easily have been hidden as well. To further reduce the number of exposed seams I used a different method for the attachment of the gusset. I now wish I had taken pictures as I worked but I promise I’ll do so if I make them again. Basically, you skip the part where the gusset pieces are basted wrong sides together and instead work with two separate pieces. Layer the two pieces right sides together with the front (or back, doesn’t matter which side you start with) sandwiched in between. Sew this seam. Then, leaving the gusset pieces right sides together stuff the entire trunks inside the gusset pieces (fabric is allowed to spill out through the sides of the gusset) until you can layer the gusset pieces right sides together with the back sandwiched in between. Make sure nothing else is caught in between and sew this seam. Now, you can pull the trunks right side out through one of the gusset’s sides, et voila, you have hidden both seams on the inside! It feels a little bit like magic. If you have constructed yokes on classic tailored shirts you might have used this technique before. Seams of the gusset are hidden in between the two gusset layers. I used my coverstitch machine (4 threads) to attach the elastic. This worked well, but next time I should pay more attention as I am sewing because I didn’t catch the trunks in all places on the first go and had to do some fixing. The one thing I didn’t like is how the pattern pieces are printed from the PDF. With a PDF pattern you have to do some assembling after printing and my printer tends to scale when it shouldn’t which can make it difficult to line things up. I, therefore, have a very strong preference for the layout of the pieces to be optimized so that a pattern piece is scattered across the least number of pages possible. 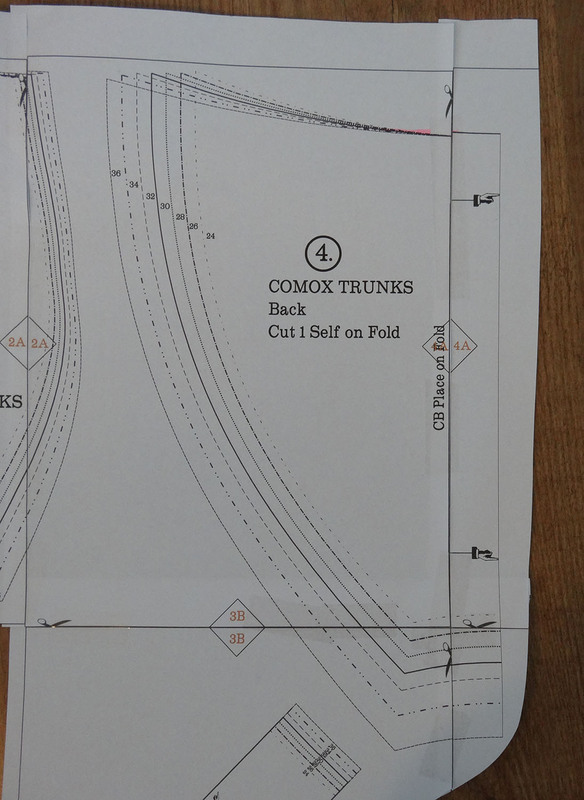 In this pattern (PDF for size 24-36), piece 3 could have fit on 1 page instead of 2. Piece 4 could have fit on 2 pages instead of 4 and piece 5 could have fit on 1 page instead of 2. Yes, this does result in the printing of more pages, but it does also result in less taping and less fudging when things don’t line up. On some pieces text runs across the markings that you need to line up the pages which I think is a bit sloppy and could easily have been avoided. This pattern piece sums up what I didn’t like about the PDF. It is printed across more pages than necessary. Text is placed across the diamond that you need for matching up. The marking that indicates you need to cut this piece on the fold is located right on top of the line that you need to cut for matching up the pages which I found a little confusing. I also had some matching issues, but I fully blame my printer for that problem. To conclude, I think this is a well drafted pattern that is very quick to make. I did all of the sewing in just one evening. I can’t really say too much about the written instructions that come with the pattern because I barely looked at them. I did read the sewalong blog posts and those were definitely helpful, even if I decided to ignore some of it. The size range of the pattern seems quite large with 24-45. I made size 30 and my brother is positively skinny so I suspect this pattern might also work for teenage sons (if willing to wear mom-made underwear, that is). The pricing of the pattern is also very reasonable as the PDF version is only CAD 7.50. Have you ever made underwear? I found these trunks very easy to make and am now thinking that making underwear for myself might not be as difficult as I used to think. Except for bras of course, those are on a completely different level of sewing and fitting. Ali asked if I could do a tutorial on how I constructed the zipper pocket in the lining of my It’s all about the zippers bag and here it is! I incorporate this type of pocket in nearly every bag I make nowadays. It can be used on the outside and in the lining. It is constructed by first creating a window in the fabric behind which the zipper is placed. 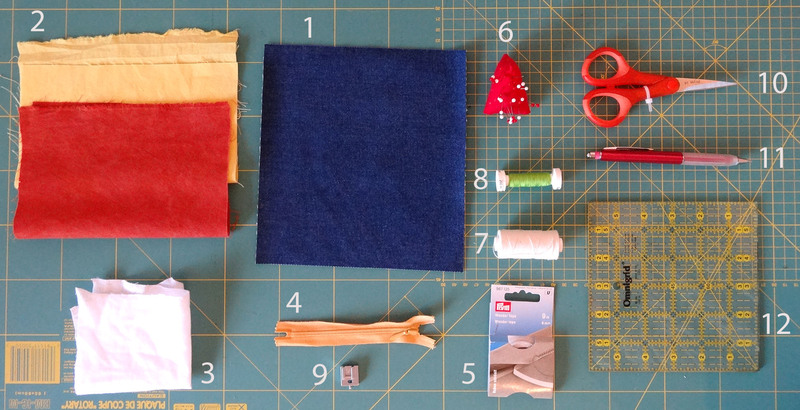 You might think that this pocket is only suitable for bag making but you are wrong there! I’ve seen this type of pocket a lot on RTW trousers lately, for example, this pair from Michael Kors has 6 of these pockets! 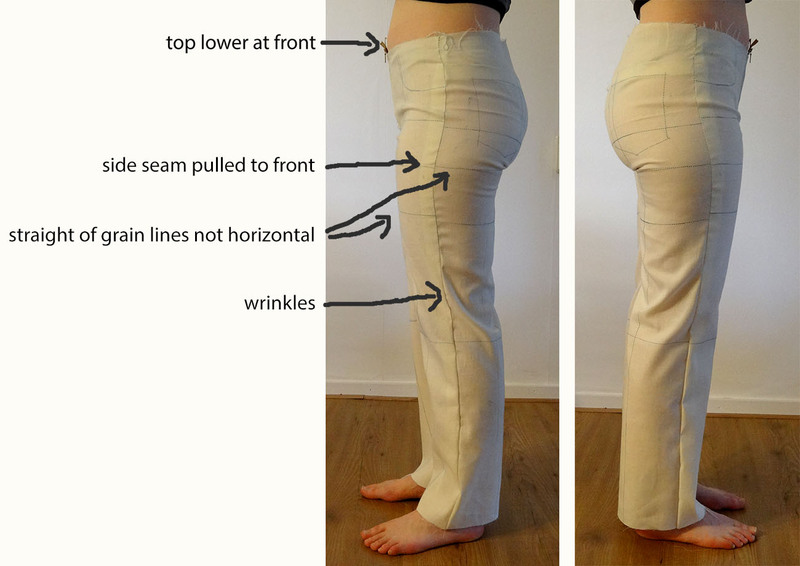 When these pockets are used in RTW trousers they’re usually not very functional because the pocket lining is very small, it is added more as a design feature. It is also often used in coats and jackets. Just take a look at the coats in your household and I’m pretty sure you’ll find a pocket or two that was constructed using this technique. I’ve taken pictures of some that I found in our coats. Sometimes they have an additional flap that covers the zipper. I think this is a nice detail so as a bonus I am also going to show you how to add two types of flaps to your pocket. This type of pocket has to be added to the pattern piece before construction of the bag or garment. So if you decide to add one to the lining of a bag you first make this pocket in the lining piece before you start assembly of the lining. I am using contrasting fabrics and thread in this tutorial for the purpose of clarity but I do recommend that you use matching thread and fabrics. 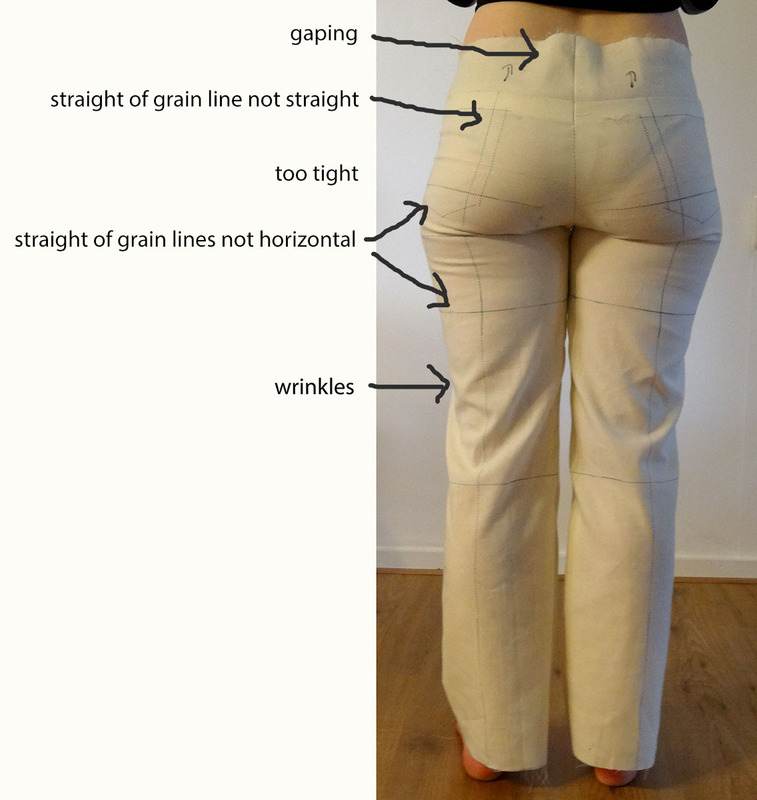 Dashed line indicates pocket lining. Step 1: Determine the size of your pocket. This has several aspects. 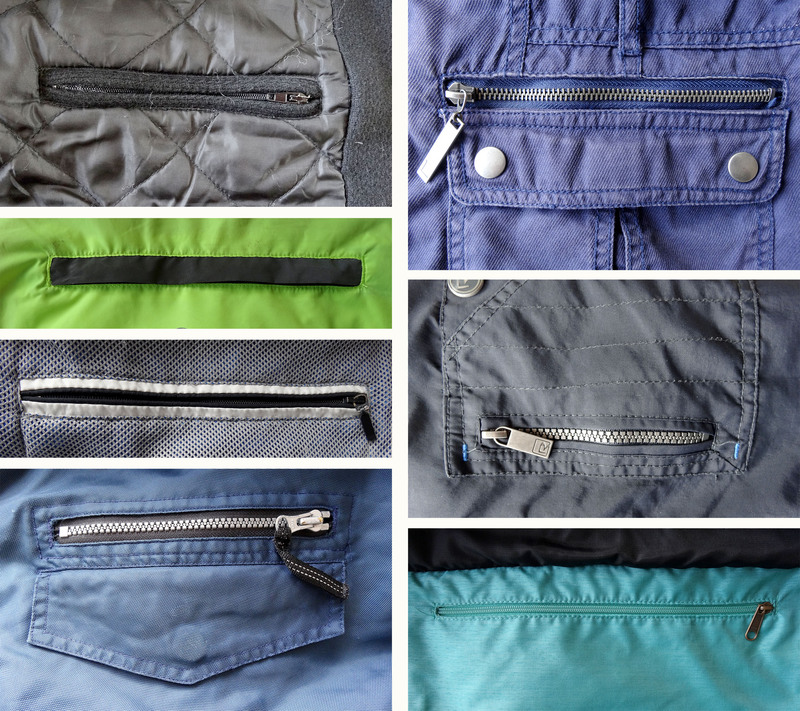 The length of the zipper window and the dimensions of the pocket lining. For a bag I prefer the pocket lining to extend at least 5 cm (2’’) from both sides and the top of the zipper window (this already includes seam allowances). This ensures easy access into the pocket but if you don’t have enough room to add this amount it will usually still work if you add less. I also make sure that the lining of the pocket is smaller than the outer fabric so that it doesn’t get caught in any seam allowances when the bag is assembled (for coat linings one of the sides is usually attached to the front facing though). I let the depth of the pocket depend on what I want to use the pocket for but I don’t want the bottom of the pocket to reach the bottom of the bag. I made a small sample for this tutorial and decided on a 9 cm (±3 1/2”) long window. The lining pieces for this sample were 19 cm (length) x 15 cm (height) (± 7 1/2” x 6”). Step 2: You will need 2 pieces of lining fabric. Cut both the size you decided on in the previous step. I recommend that one matches either the zipper or outer fabric colour because a small sliver of it will be visible from the outside. 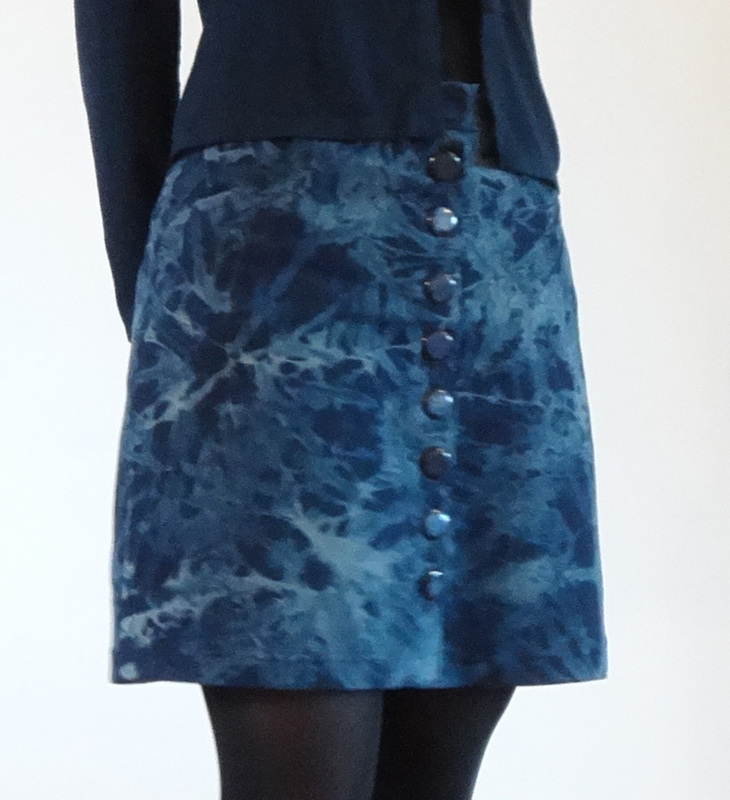 The other piece can be a fun print or contrasting colour. If you want to use the same fabric for both pocket lining pieces you can also cut one piece that is twice as long and fold it back up on itself to create the pocket lining. When I add this type of pocket in a bag lining I will usually also use the lining fabric for one of the pocket lining pieces. When added to the outside of the bag (sturdier fabric) I try to find a piece of e.g. quilting cotton that is a close match in colour because it can become a bit bulky otherwise. 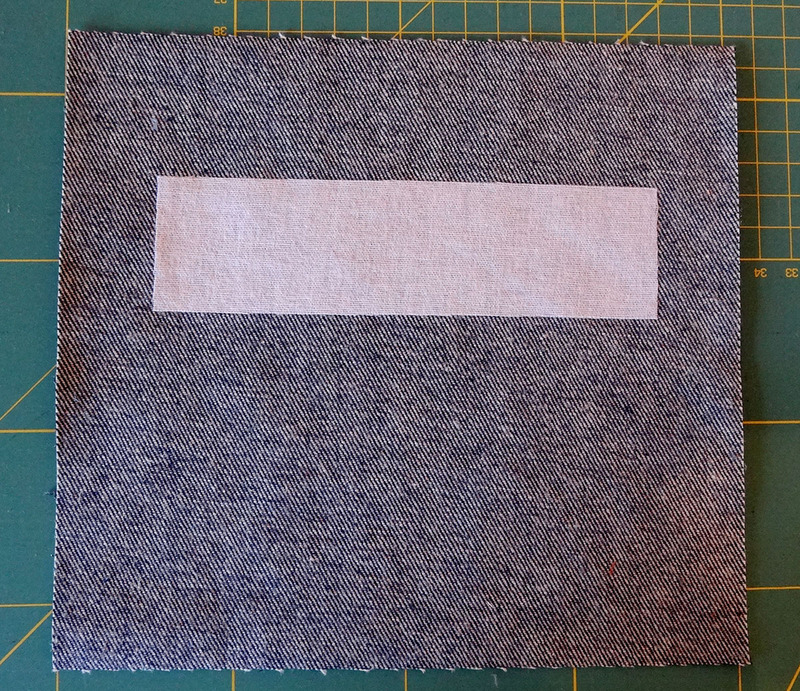 Step 3: Add some fusible interfacing to the wrong side of the pattern piece you want to add the zipper pocket to. It should be placed so that the zipper window will end up more or less in the centre of the interfacing. This will add a bit of extra stability, a lightweight interfacing will do fine; you don’t want to add a lot of extra bulk. I cut my piece 15 x 4 cm (6” x ±1 1/2”) When I add this pocket to a bag exterior I’ve usually already interfaced the whole piece, in that case I don’t add any extra interfacing. Step 4: Pin one of the lining pieces (the one that matches the outer fabric) right sides together to the main fabric. The fabric should be placed exactly how you want it to end up on the back. Step 5: Draw the desired window opening on the lining piece using the ruler and fabric marker. For most zippers a 1 cm (3/8’’) wide opening works well. I drew my box 9 x 1 cm (±3 1/2” x 3/8”). 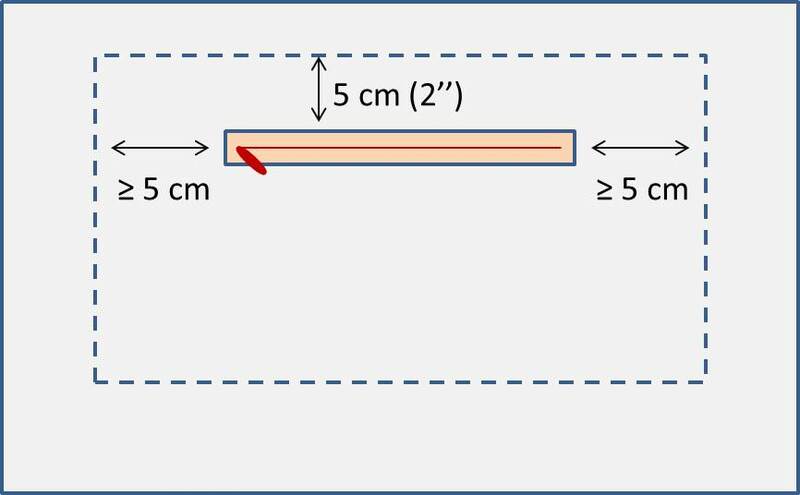 Draw another line in the box that is in between the two long lines and makes a V-shape to the two corners starting ± 1 cm (3/8’’) from the side. Step 6: Stitch around the box that you just drew, backstitch to secure. If your machine has a needle down function it can be useful for this step because you have to pivot in the corners. Step 7: Use scissors or a seam ripper to make a small hole on the line inside the box. Cut the box open on this line and cut into the corners in the V-shape. Cut as close to the stitching as possible but be careful not to cut the stitches. 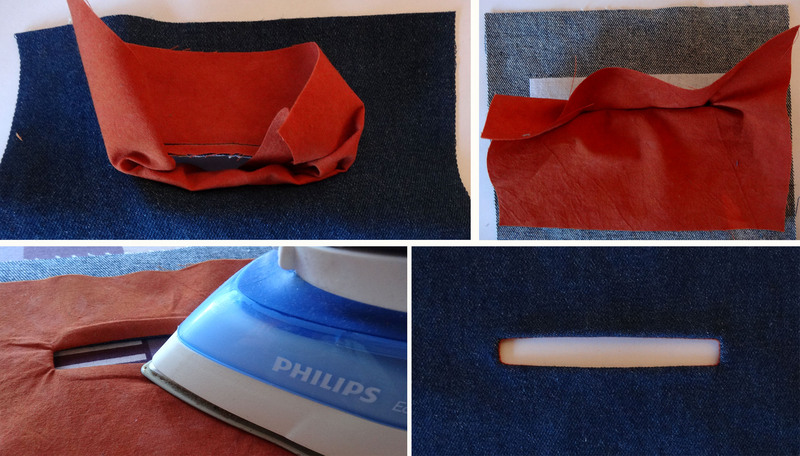 Step 8: Fold the lining fabric through the hole you just cut and use your iron to press the lining neatly to the back. You want to see as little of the lining fabric on the front of the window as possible but it is a bit inevitable that some of it will remain visible. 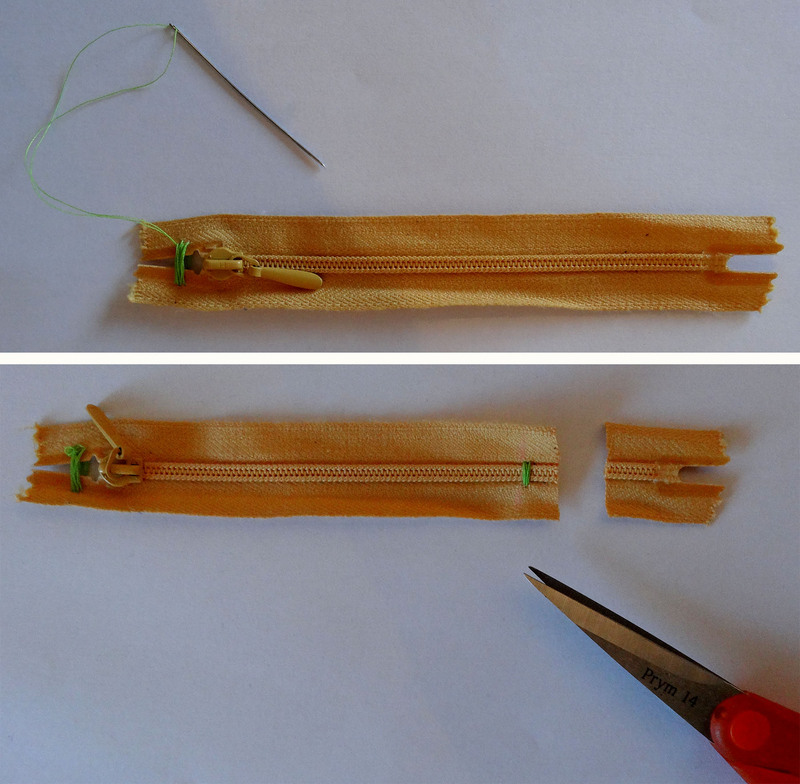 Step 9: Sew the zipper ends together at the zipper pull side. You don’t have to pull the zipper tapes very close together because that can distort the shape of the zipper a bit. I find that doing this step makes it easier later on to sew the zipper in place. Step 10: Position the zipper behind the window. There are at least 3 different methods to do this 1. Pin the zipper in place. 2. First pin in place, hand baste in place and then remove pins. 3. 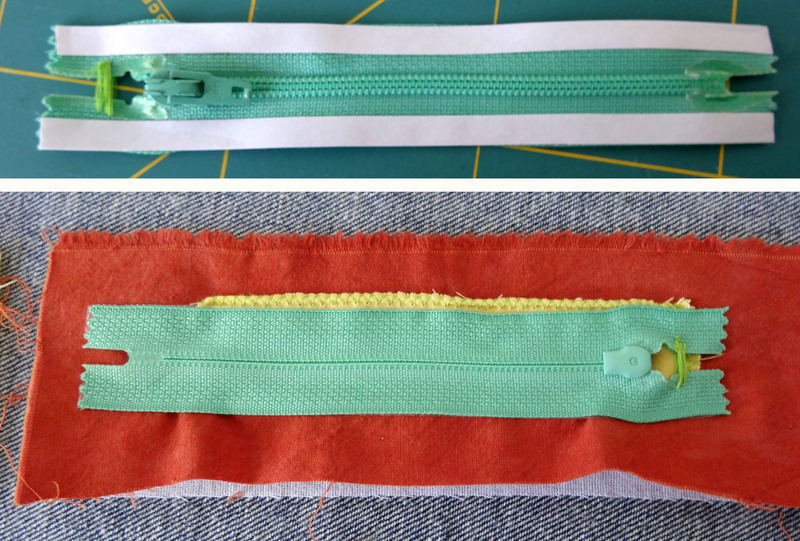 Use double sided tape to stick the zipper to the fabric. 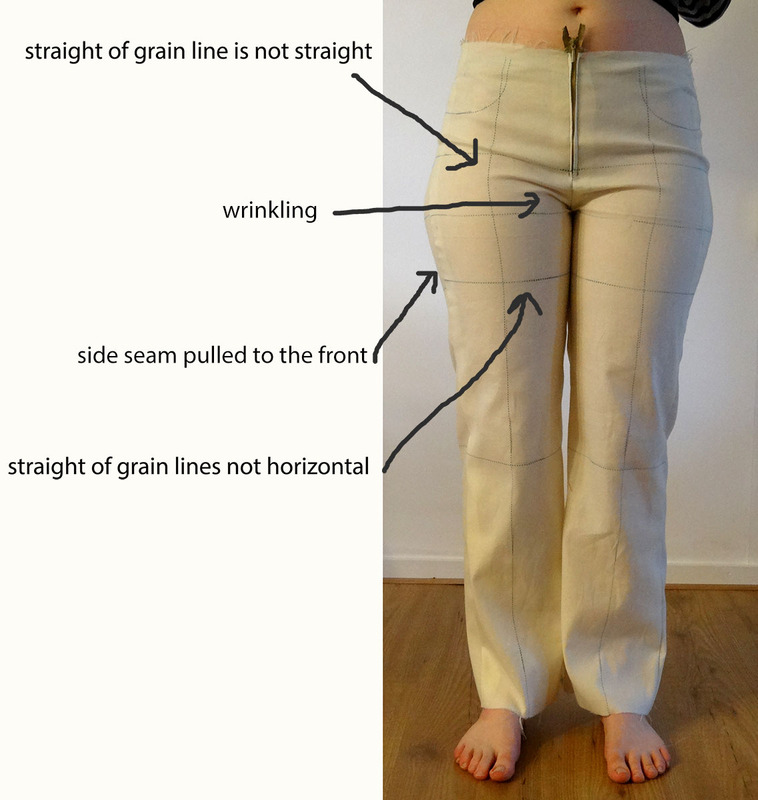 The last method is my favourite because it is fast and ensures that the zipper stays nicely in place when sewing. Pinning is my least favourite method because the pins can get in the way when sewing and the zipper can more easily shift during sewing when you remove the pins. 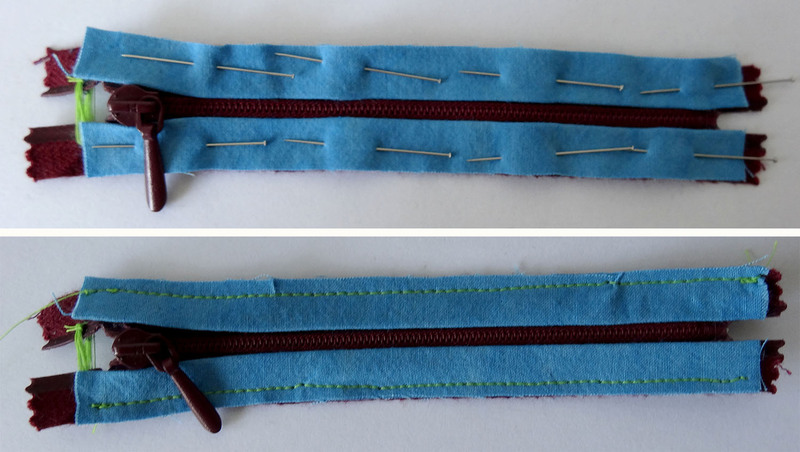 Step 11: Use your regular zipper foot to topstitch around the zipper window to sew the zipper in place. 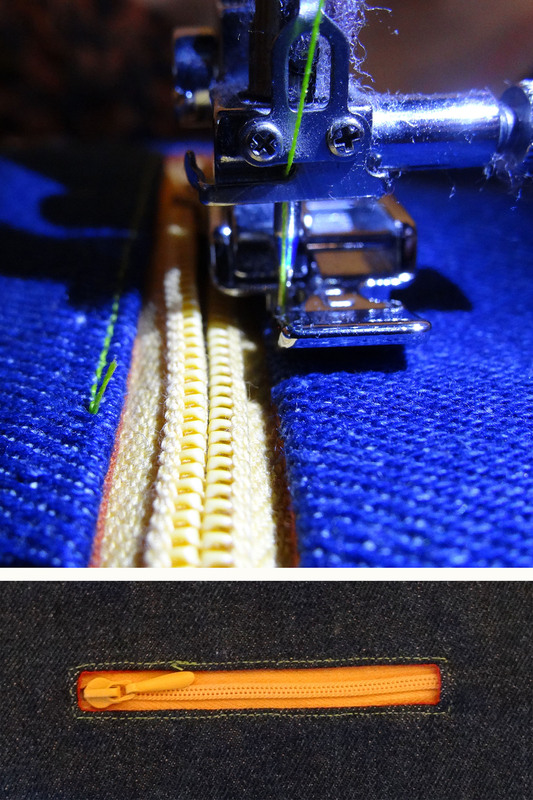 Unless you are really confident that your topstitching is absolutely spot on I recommend to use a matching thread. If you have a needle down option on your machine it is really helpful to use it for this step because you have to pivot in the corners. When the zipper pull gets in the way carefully unzip the zipper with the needle in the fabric. Step 12: Pin the other piece of lining fabric to the piece that is already sewn to the window. I like to use a contrasting colour or a print for this piece because it gives a nice surprise when the pocket is opened. Step 13: Sew around the two lining pieces with a 1 cm (3/8’’) seam allowance. 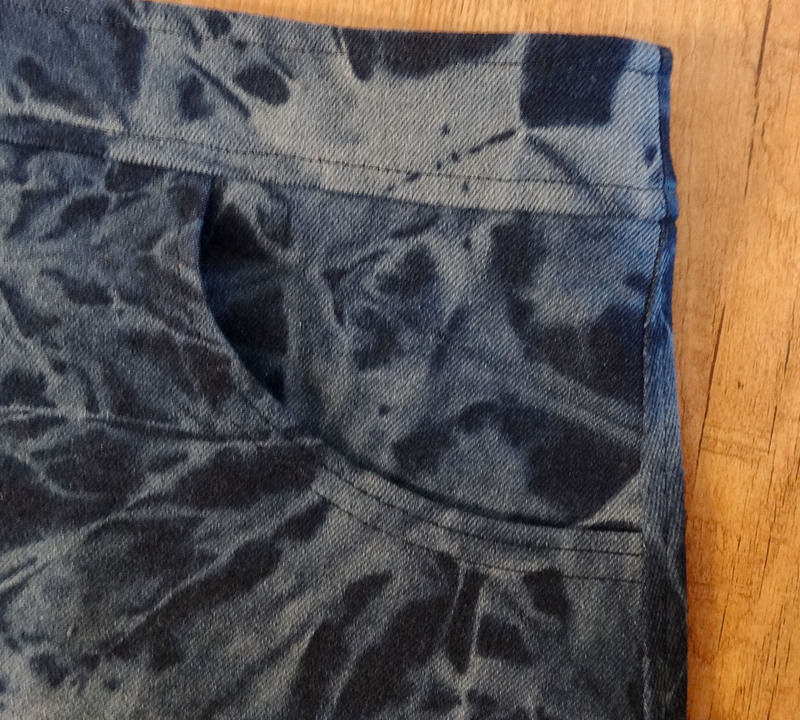 Make sure not to catch any of the outer fabric into your stitching. For an extra sturdy pocket you can finish the edges of the seam allowance with a zigzag stitch or use an overlock stitch. 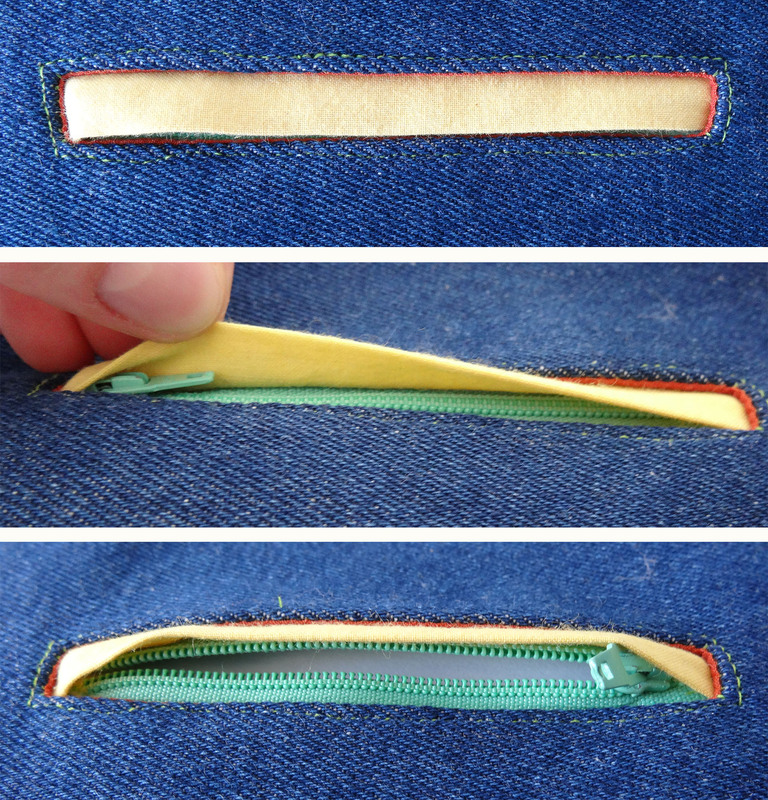 You are done and have successfully made a zipper pocket! Continue assembly of the bag or garment. 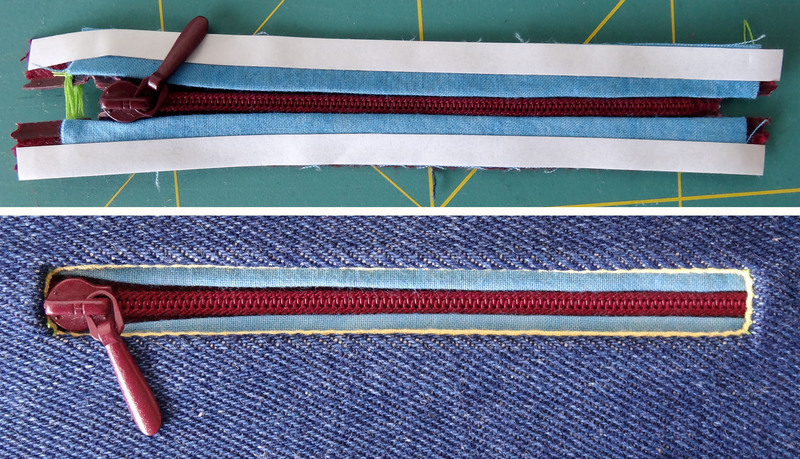 Now I will show you 2 variations on the zipper pocket. 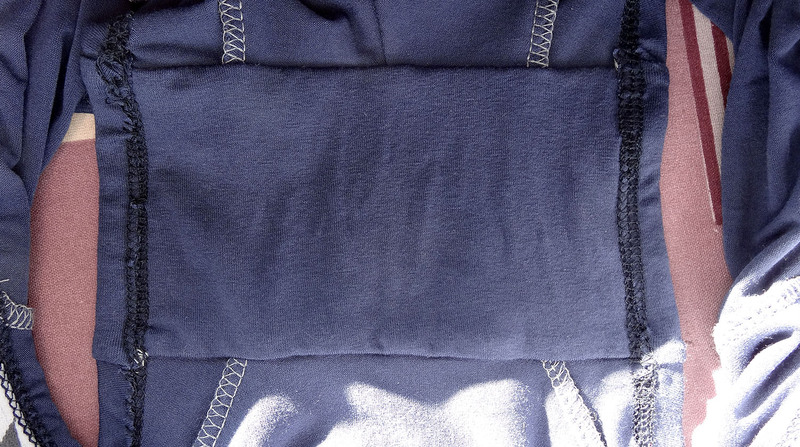 In the first variation a flap is incorporated that covers the whole zipper so that you can’t see the zipper from the outside until you lift up the flap. In the second variation two smaller flaps are sewn right next to the zipper teeth. These cover the zipper tape and can add a nice touch of colour to your pocket. 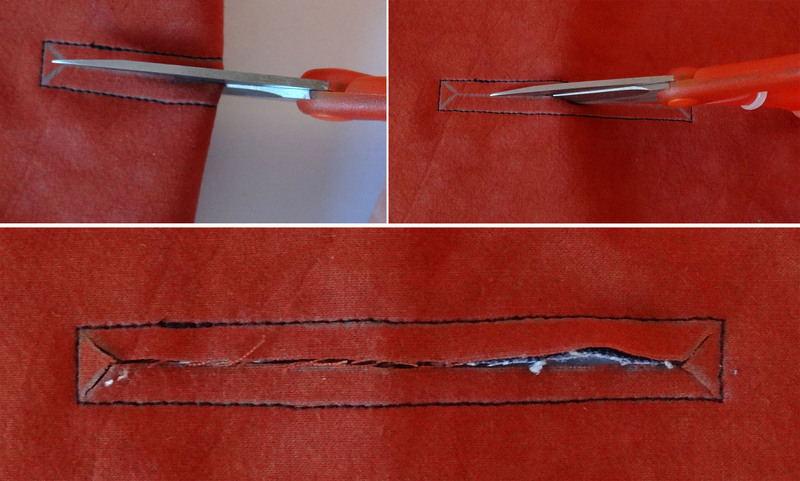 For both variations you will first follow steps 1-9 of the standard zipper pocket tutorial to create the window and prepare the zipper. Step a: Cut a piece of fabric for the flap. My window was 10 cm (4”) long and I cut the piece 12 cm (±4 3/4”) long and 5 cm (2”) wide. Step b: Fold the piece of fabric in half lengthwise and press. 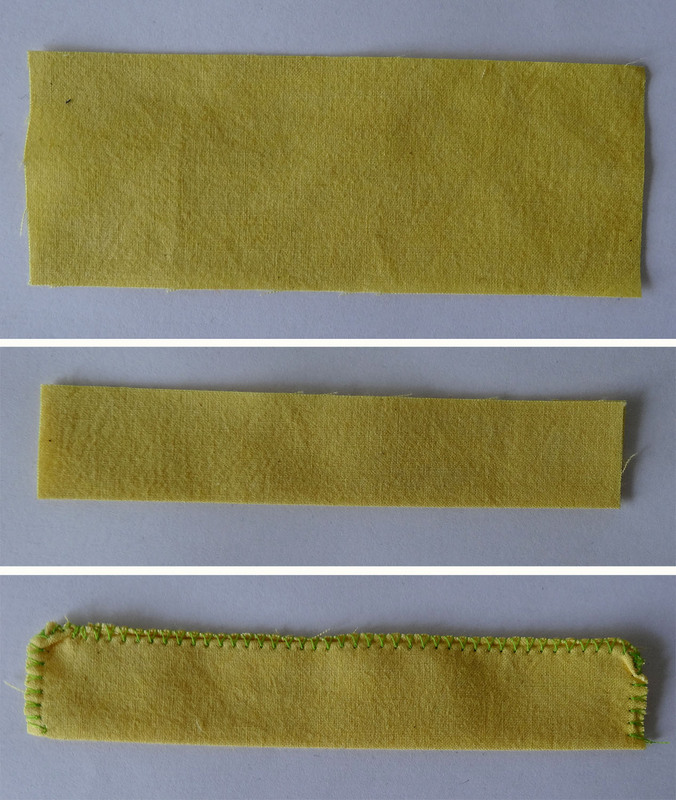 Step c: Use a zigzag or overlock stitch to finish the 3 raw edges. Step d: Position the flap behind the zipper window. The fold should touch the lower edge of the window. I first pin and then hand baste. It is important that the handbasting stitches don’t get too close to the edge of the window because you don’t want to topstitch over them. Step d. Note that I made a sample for this tutorial and used a scrap for the pocket lining piece. For a real pocket I would have used a larger piece of lining fabric. Step e: Position the zipper behind the flap. The zipper teeth should end up in the centre of the zipper window. I again prefer to use double side tape but you could also pin or hand baste. 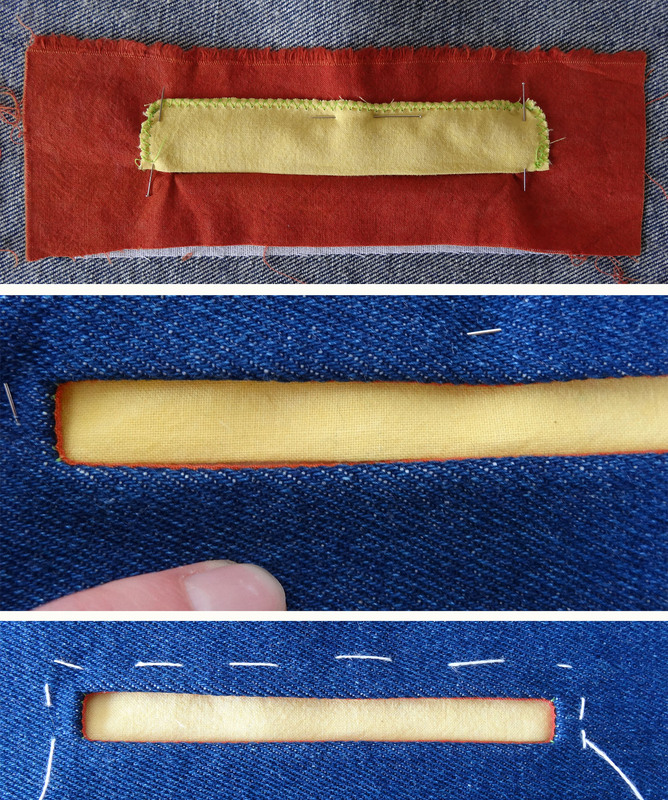 Continue with step 11 of the standard zipper pocket tutorial to complete the pocket. Completed zipper pocket with flap. Step I: Cut two pieces of fabric for the flaps. For my 10 cm (4”) long zipper window I cut them 13 cm (5 1/8”) x 2 cm (3/4”). I chose a width that was 2x the width of the zipper tape. Step II: Fold the pieces in half lenghtwise and press. You could finish the raw edges with a narrow zigzag or overlock stitch (you don’t want these stitches to be visible in the window) but it is not really necessary. Step III: Place the folds of the flaps right next to the zipper teeth and pin in place. Step IV: Sew the flaps to the zipper tape, stay quite close to the edge of the zipper tape because you don’t want these stitches to show up in the window. Step V: Position the zipper behind the zipper pocket. I used double sided tape but you could also pin or handbaste. You want the zipper teeth to end up in the centre of the window. 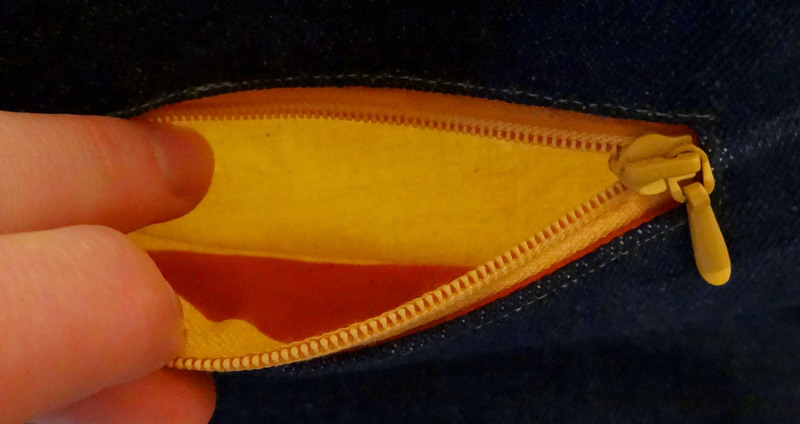 Completed zipper pocket with 2 flaps. Do you think you will give this type of pocket a try in one of your next projects? Which of the 3 variations that I showed is your favourite?